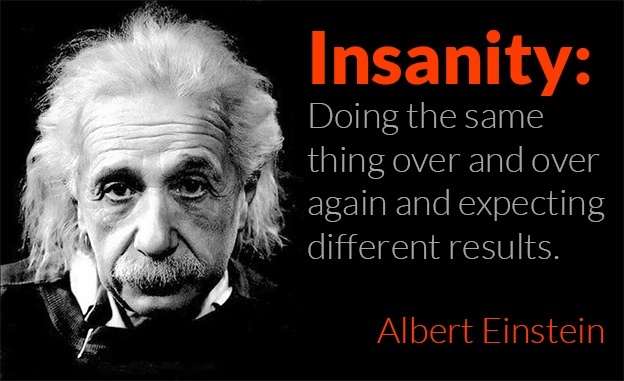 I do believe it was Einstein, who defined insanity, as doing the same thing over and over again hoping for a different out come. Making a difficult relationship work, means CHANGES have to be made. I am embarrassed to say, it took me countless break ups with the same guy, over the same things, nearly a million crazy times to finally realize; things won’t get better, till I change something. YES, ME not him. I focused so many hours expressing my feelings, and hoping my guy would change his ways. I found my voice soothing to myself, while disregarding how annoying it must have been for him. I think a lot of us make this mistake of trying to “teach” your partner how to love you. For some people this may work, but in my situation it NEVER DID. What does seem to work is changing my behavior. Lead by example. If you want positivity in your relationship, be the first to put it there. DO something nice for no reason and most importantly DO NOT JUMP SO QUICKLY TO ACCUSE AND THINK THE WORST. Give them the benefit of the doubt. Seeing the best in the person you love, helps them WANT TO BE BETTER. The challenge is, YOUR STRENGTH. It is very hard to maintain the stamina to control your ego. It is your EGO that demands kindness in a sour way. Let your HEART fertilize kindness in a organic way. I can not count how many times I started arguments feeling sorry for myself. I focused all my energy on what I needed and what I deserved. In the heat of the moment those thoughts and words seem VERY true, and you say them because you are HURT and want confirmation that you are wrong. When you don’t get that confirmation you start spiraling further. When the reality is, you know deep down it’s not true. One of the main things my guy disliked about my behavior was how I was so quick to disregard his efforts to show his love for me. In his way he tried harder than he ever did for another girl, and it fueled such anger in him to hear me so casually disregard all of it. Don’t use low blows in fights hoping to get a hug, or an apology, because I promise you, it’s not coming. STOP ACCUSING, and START LISTENING. I promise you nothing works better than saying something sweet, followed by silence. Let him explain to you. “I’m right, you’re wrong.” Is basically the simplified formula of any argument. The funny thing is, if you decide to be partners, it makes no sense to argue who is right or wrong. What you should be doing is focusing on solutions and destinations. If you do not like something, then figure out a way “together” to make it work. WORK together to make it right. Competing for your egos is the quickest way to a blow out fight. TIP 4: HOW NOT TO RUN. Things are tough, and if your anything like me or my partner, you will constantly want to run. I think we are biologically programmed to reject discomfort. However, you can’t get anywhere in a difficult relationship until you decide, “running” is not an option. This tip is still a hard one for both of us, and sometimes we slip up. But we talk about it when things are going well, and make pre-planned decision to not say “break-up” or threaten leaving whenever things get heated. It’s amazing how a simple change like this, can strengthen your relationship and make you feel like you are on the same side. It really helps with trust. In the past I often defined my relationship as a merry-go-round of horror, and I have discussed it with my partner, and we joke about it now. This theory is about not letting ourselves repeat all our mistakes. We all have bad habits and flaws, but with discipline you can check yourself.Analyze your problem spots in the past and come up with a strategy together to prevent it from happening again. SOLVING these mistakes, churn out new experiences together, and find you no longer repeating same situations. It has been a very long time, and I have been thinking so many thoughts these days. I figured, what better place than here, to purge my deepest thoughts. First of all, LOVE is a crazy thing! At least for me, it has been quite a crazy ride. It forces you to learn so many lessons about yourself and demand a higher character level. This is the thing that nobody talks about, and I wish someone would have given me a heads up. When you fall in love you become crazy. lol. Literally. Im serious. We all have differing degrees of ‘love crazy’, and it is largely correlated with all your pre-existing baggage. Love enhances all your emotions, and energies: good or bad. For example, my dad left when I was 8 years old. I never saw my Dad much again, and now we have no contact. The funny thing is, he was never an active dad and when he left, I never felt much sadness. I was a very good kid and never rebelled or showed signs of a broken home. I was always very independent, positive, and forward thinking. My life felt complete and rather happy. However, everything changed when I fell in love. Of course it always starts out with the GOOD stuff. The wonderful, beautiful memories of finally meeting the person who SEES you completely and loves you. They SEE you for you and the soul you have. You bond on the deepest level, and this shatters you. It shatters all the fake walls you have built through out the years to protect yourself. All of it is torn down and you experience this powerful bond with another human. The world literally glows through your eyes but it is terrifying, because you feel naked.Exposed. I was a mess. The more I loved, the more I feared abandonment or betrayal. I was crazy jealous, and it didn’t help that ‘my guy’ had a scandalous past. Its funny how your soul pair, “sometimes” can be everything that pisses you off. Everything you were brought up to believe is wrong, or “not love”. I had TERRIBLE anxiety, and thought I was losing my mind. Always testing him to see if he really loved, and always feeling disappointed. Almost everyone, including myself, believed the only problem was my guy. This is when you are tested. Some people who had a near perfect childhood may not have the slightest problem with fear of abandonment or betrayal. I have seen such couples, who easily love, and respect each other. People only talk about these “perfect” couples, and it makes everyone acting like a crazy fool, think they are in some “codependent, abusive” relationship. When the reality is, YOU are messed up and most likely the person you are with is messed up. The only way a messed up person can live peacefully, without fixing their mess, is if they are with someone does not love them nor someone they love either. Why? Because love, triggers your demons. What you have to do, is not run from your problems. Stop blaming your partner and start looking at yourself. Understand that most love relationships are MESSY.. They are not DISNEY FAIRYTALES. Think more a long the lines of Shakespeare and the mess that creates a magnificent love story. If you want a life “in love” you must face your demons, and FIX THEM. IF you don’t FIX THEM, the relationship with BREAK. You both must, become better people who learn to control fears, and anxieties that are effecting your entire life and learn to RESPECT love. LOVE IS A BATTLE FIELD. Everyday, it is a fight to keep it going and not give up on myself and each other. This love has never been easy, but I can confidently say, it has made me a better person.